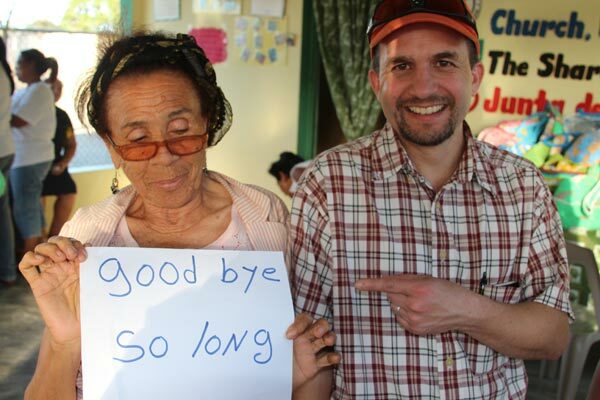 In about a half-hour, we’re going to pack the van and head south to Santo Domingo for our last night in the D.R. We’re all looking forward to some beach time, as well as the opportunity to talk beneath the stars about what we’ve witnessed over the past week. Below is a photo from yesterday afternoon’s visit to the women’s group. I’ll write about that visit when I find the time, perhaps in the Miami airport. There is still a lot to share, even though our trip is winding down. That's me (Ryan) on the right. 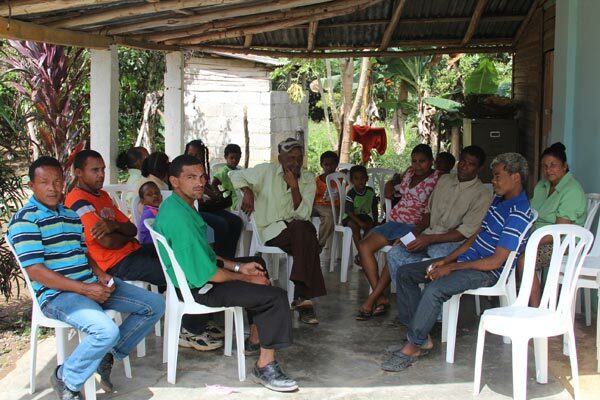 Here are some photos we took during our clinic visits on Thursday and Friday, to Las Guyamas and Arroyo Vuelta. Both the internet and electricity have been unreliable, so I’ll take a moment when both are working to post some photos from our clinic at El Limon (a small settlement at the top of a mountain outside Cotui) yesterday. We were supposed to be at the clinic for two hours; we were there for four. 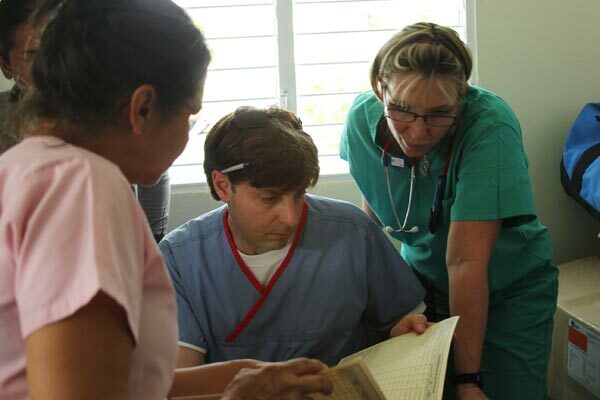 The doctors (Justin, Jennifer) and nurses (Rita, Chris, Kathy, Raeann) saw over 30 patients. We gave away many dental care kits and bags of vitamins, made some new friends, and saw two legitimate emergencies: a young man who had fallen off a motorcycle and had seriously abraded his leg (he needed further treatment in Cotui), and another young man who had an allergic reaction to a bee sting. The clinical folks were energized by the opportunity to work. Lots of excited chatter in the minivan on the way back to Cotui. As we jounced along over speed bumps and stones in the moonlight, I thought that such a road may be more intimidating for a group from, say, New Jersey. But the road wasn’t much rougher from some of the roads we drive on in the Upper Valley. I’ll try to write more when we get the time, and the next time the power is up. Today will be busy, with at least one clinic, and maybe two. It’s fun to hear the clinicians discuss their game plans. We’re really working now. Rita, Justin, and Chris prepare for Wednesday afternoon's clinic in El Limon. 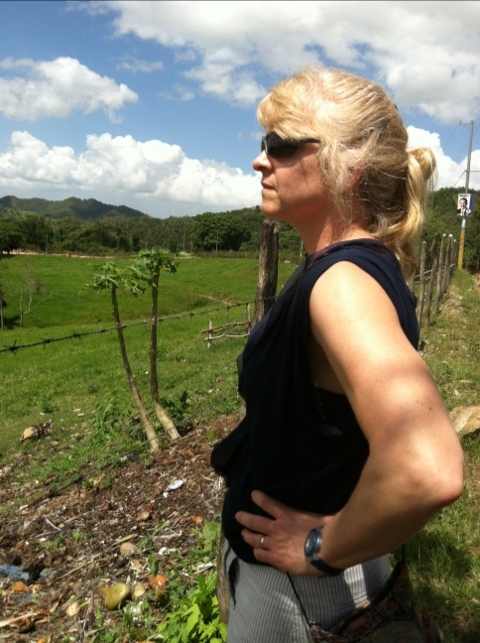 Raeann looking out over the greening valley a few miles outside Cotui, our final destination. Lots of driving today, from Boca Chica through Santo Domingo to Cotui. Many good photos and lots to tell about a visit with a women’s group this afternoon. Will write again Wednesday morning, although the internet has been unpredictable. I’ll take the chance now to make this quick post. 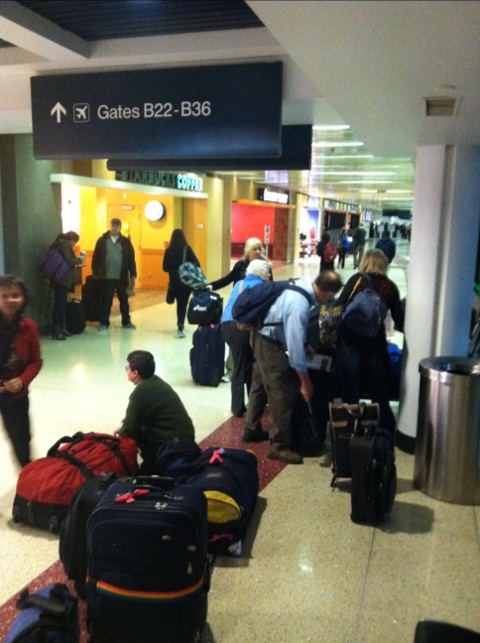 Twelve heavy bags among seven people. Lots of weighing and repacking to fit under the 50 lb. limit. None of us got much sleep last night; too excited for the coming day. Our shuttle bus driver was from Puerta Plata, on the northern coast of the DR. He was impressed by the purpose of our trip, as well as by the volume of our luggage.